Preheat oven to 400°F and line a sheet pan with parchment paper. Toss brussels sprouts with olive oil and Sriracha Seasoning Blend. Pour a single layer of brussels sprouts on the sheet pan, and roast in the oven until the edges start to brown and the sprouts start to become tender, about 20 minutes. Remove from the oven, and add the almonds and coconut to the pan, tossing until evenly incorporated. Continue baking until the sprouts are tender and the nuts start to brown, about 5 to 8 additional minutes. Add additional seasoning to cooked sprouts if needed. You can buy the Sriracha seasoning blend right here! 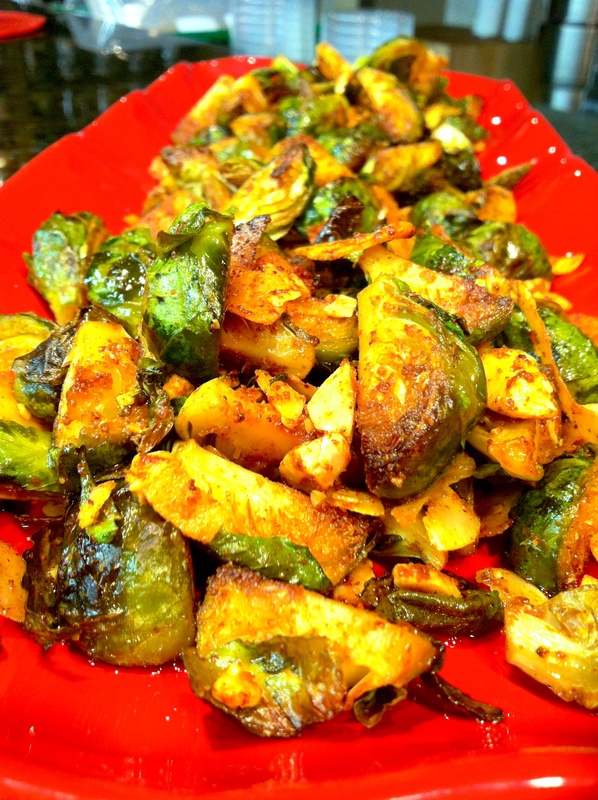 Brussels sprouts…I know please give them a chance. They have bad PR department. Giggle. All types’ of tea either loose leaf or bagged. My favorite is green tea with pomegranate via Bigelow. Also I like Teavana tea as well follow them at @Teavana. Cous Cous cooks up quickly and is filling, which makes it awesome. Seeds and nuts are great for a quick snack. My top two are almonds and pistachios. Pistachios are great for digestion. Sweetgreen is a restaurant in DC that makes something I love….salads. Follow them at @sweetgreen. Honorable mention to HipCityVeg (@HipCityVeg), which makes tasty reasonable priced vegetarian food as well as delivers in Philadelphia, PA.
A local lady who is doing great work bringing tasty vegetarian food to Philadelphia’s Germantown area. You can follow her at @UptownSoulFood. Walgreens because I love everything that they are doing to improve society’s healthcare. The ACOs, mobile apps, eradicating food deserts, and the new Well Experience store format. Walgreens is tied with Aetna for 10th place. Aetna is having great success with differentiating itself in the payer market via population health, mobile apps, and being a pioneer in customer engagement. Honorable mention goes to Nike, which has been leveraging social media to increase their market share of their running shoe. I grew up wearing Nike, so I am biased. I never thought that I would be discussing romance and apps. However, there is famous saying that is often quoted, “There is an app for that!” Hula app helps with an important public health issue STD testing. Studies say that from November to Valentine’s Day is a busy time for online dating, so why not get an app to learn your partner’s STD status, so in comes Hula. The mobile application is called Hula, which is currently only available on iOS. The application is a middle man between the patient and the healthcare provider. Information is only available to the patient and the intended partner. There is no sharing to Facebook. Hula staff is well trained to interrupt the results. The application can assist you with finding testing centers, set reminders to get tested, and gives date/time stamps for when you are tested. It makes a difficult conversation a little less so. Those in under-served areas are users of mobile technology, so this is accessible to them. The issue of the digital divide is addressed. The patient’s privacy concerns are addressed. One’s testing results should be easily accessible and understood by consumers themselves. Hula is being a role model for other mobile applications. Most importantly this app is efficiently addressing our nation’s public health organizations ability to test for STDs.